When Hilary Mantel returned to Britain in 1982 after living in Botswana for five years she noticed unfamiliar green book spines everywhere. She discovered that these were Virago Modern Classics and recognised them as a change for the better in the world of publishing. Virago was founded in 1975 by Carmen Callil, Marsha Rowe and Rosie Boycott. It was one of a wave of new feminist publishers established in the 1970s that also included Pandora, Sheba and The Women’s Press. 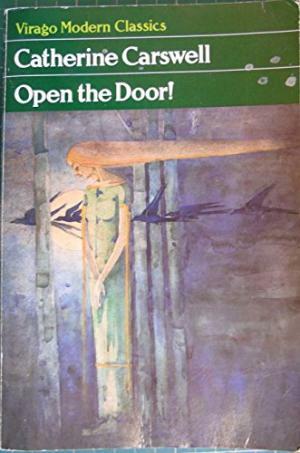 Initially it published mainly new non-fiction works but in 1978 they set up a new imprint Virago Modern Classics with the aim of bringing neglected works by women writers back into print. Virago Modern Classic no. 1 was “Frost in May” by Antonia White. First published in 1933 and long out of print “Frost in May” is the story of nine year old Nanda Gray and her experiences when she is sent to school at the Convent of Five Wounds. Other classics appeared by authors familiar, vaguely familiar and almost completely forgotten such as Sylvia Townsend Warner, Christina Stead, Margaret Atwood, Jane Bowles and Stevie Smith. The core of the list was neglected novels from the early 20th century. Works such as Dorothy Richardson’s 13 novel sequence “Pilgrimage” reprinted in four volumes as a Virago Modern Classic. “Painted roofs” the first volume in the sequence was published in 1915 and new volumes appeared throughout the 1920s and 1930s. It tells the story of Miriam Henderson as she makes a life for herself as an independent woman in the early decades of the 20th century. When initially published it was reviewed as an important and bold literary experiment, a pioneering stream of consciousness narrative but by the 1950s was largely forgotten. Quickly something unusual in publishing started to happen, the series built up a fan base who would buy anything published as a Virago Modern Classic knowing they could trust the Virago editors to come up with the goods. For many bliss was curling up with a cup of tea and the latest Virago Modern Classic. 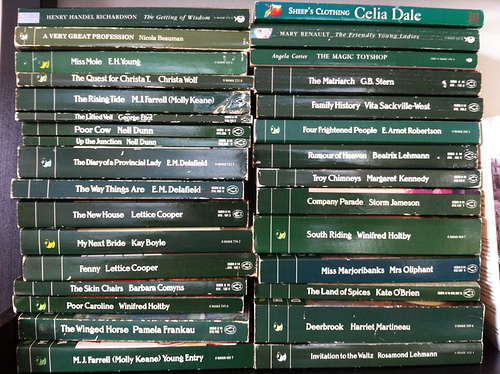 In a Guardian article in October 2007 the novelist Jonathan Coe remembers coming across a display stand in Heffer’s bookshop in Cambridge in 1982 filled with books with the distinctive bottle green spines of Virago Modern Classics. “Modern Classics”: that was the phrase that puzzled me. “Virago Modern Classics.” There was something very odd about them. I knew what a classic was. I knew what a modern classic was. I even knew who the authors of the modern classics were: James Joyce, of course, and Virginia Woolf, and Evelyn Waugh, and all those other familiar names. But who on earth were these people? Dorothy Richardson, FM Mayor, May Sinclair, Rosamond Lehmann … I could see only two things that these mysterious writers had in common. They were all women, and I’d never heard of any of them. The 21 year old Coe dove in and starting reading and soon they would have a deep effect on him both as a reader and a writer. As a consequence his first published novel “The Accidental Woman” had a female protagonist and his 2007 novel “The Rain Before it Falls” was in part a homage to all the Virago novels he had read.